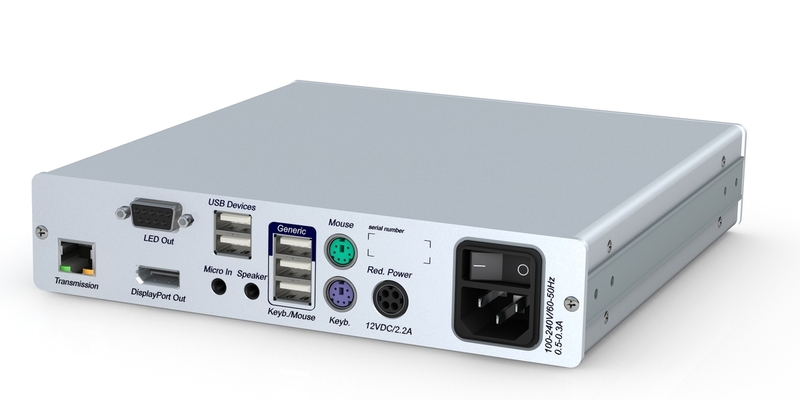 The G&D DP-U-CON - User Interface Module connects to your User Station via DisplayPort single Link (1920x1200) or Dual Link 2560x1600, PS/2, USB & audio cables, it then extends the User Station to the G&D KVM switch via either CatX cable up to 140 meters. The transmission takes place via CAT cables or optical fibers (only for ControlCenter range) thus allowing transmission distances of up to 10,000 m.The computer modules DP-HR CPU are available in different expansions and differ based on the number of video channels, the transmission medium, the transparent USB transfer and the possibility of controlling redundant matrix switch clusters. The basic console modules make it possible to configure your system to exactly fit your needs. They are divided by the transmitted video signal and are available in additional variants. These expansion stages and additional functions can be found below. Integrated USB transmission without extra wiring With the "U" variant it is possible to transmit transparent USB without any additional devices. There is no need for additional cables or devices. This solution achieves a transmission rate up to 16 Mbit/s. For higher rates you need the U2-R-CON modules.